When I was home last summer, a friend of my mom’s wanted me to come over and look at some furniture she was getting rid of. 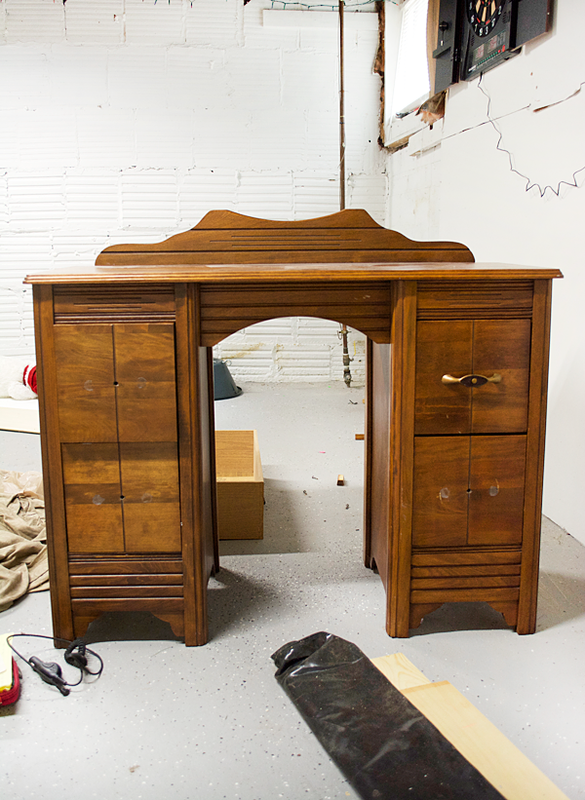 One of those pieces was this beautiful vanity. I didn’t really have a need or place for it, but I took it off her hands. When we moved into our new place last year, we brought it up into our bedroom and I had been using it as my makeshift nightstand. 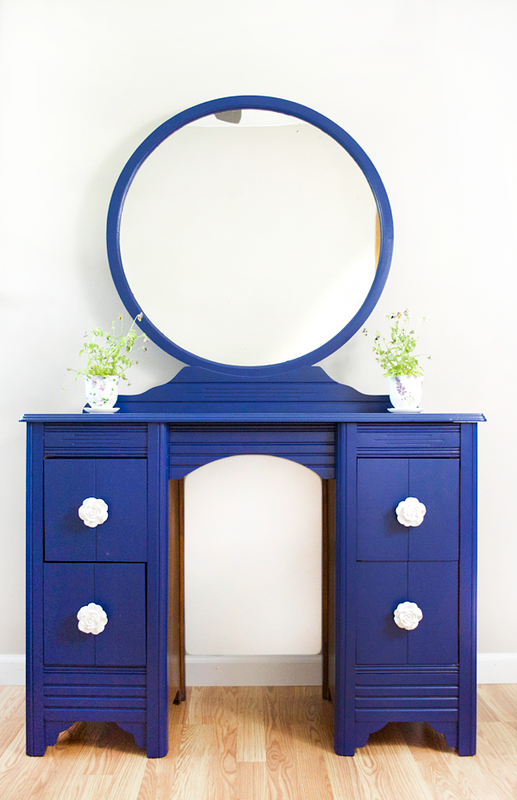 It just so happened around the same time I was planning our master bedroom makeover, my friend asked me about a vanity. Perfect timing. It was in pretty decent shape and I will admit there was a small part of me that didn’t want to paint it, but I had no use for it and I was happy to make it into a beautiful house warming gift for my friend. I pointed her in the direction of DecoArt’s Satin Enamel paint after having such a great experience with it on this piece. I mentioned it in that post, but I’ll say it again. You don’t need a topcoat. And it’s amazing. 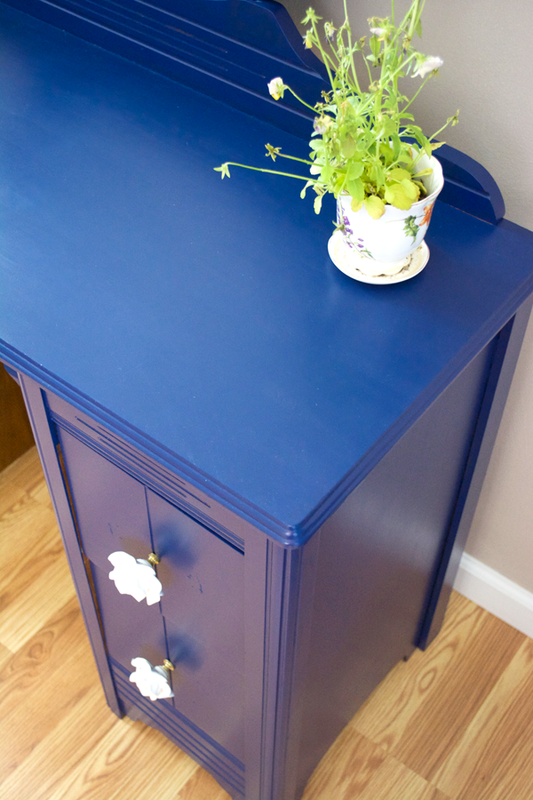 I hate finishing a piece of furniture, it’s my least favorite part of the whole process, so when I discovered this amazing paint I was hooked. 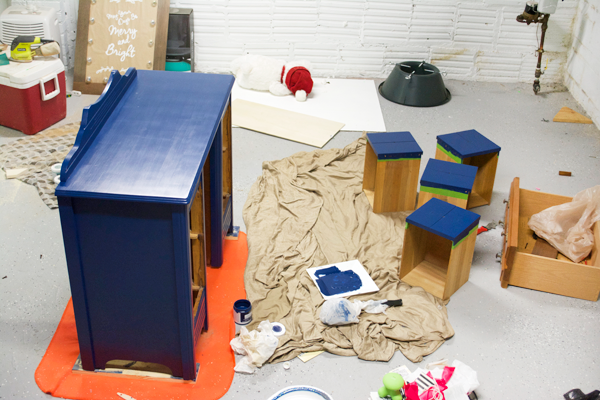 And even knowing that this vanity top would be getting a lot of traffic, I was confident in this paint. It goes on super smooth and dries quick. I did three coats using a foam roller and a brush for the smaller nooks and crannies. 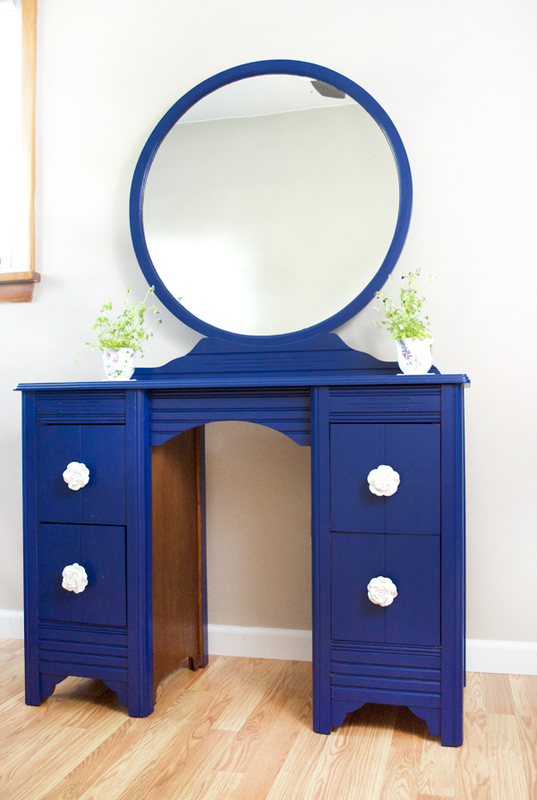 The knobs are from Country Chic Paint and I love how they add a touch of femininity to the piece. I decided to leave the inside unpainted for a little bit of contrast and I’m glad I did. The blue is gorgeous but definitely bold. I can’t wait to see what kind of cute little chair she finds for it! 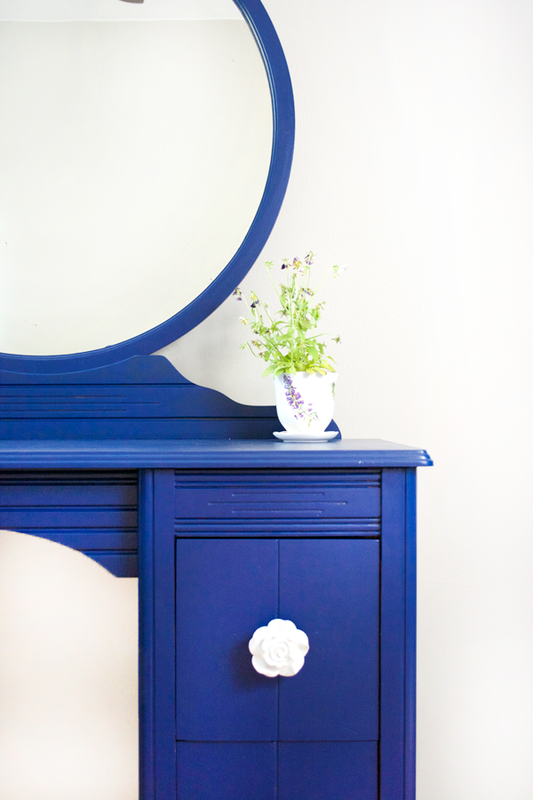 If you’re just starting out with painting furniture, this would be an awesome paint to try. I would still recommend a little sanding before applying, but it sticks great. You can find it at Hobby Lobby, JoAnn Fabric and A.C. Moore and Michaels will be carrying it soon, in August! 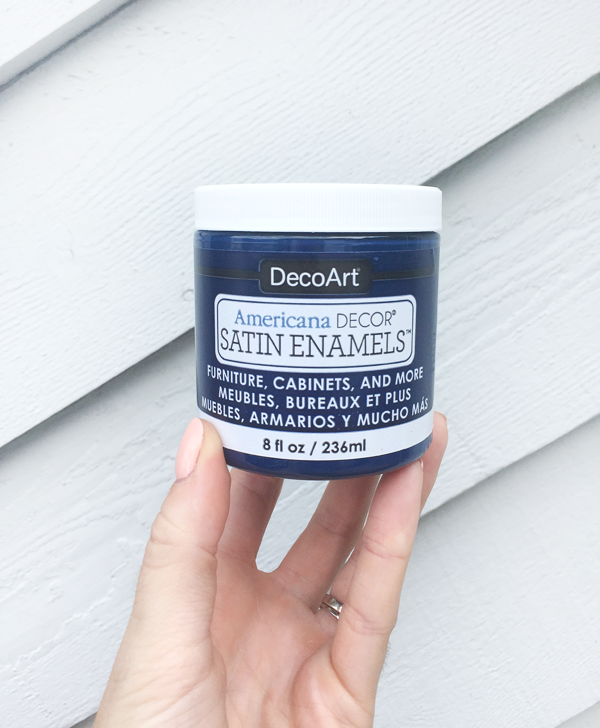 This post was sponsored by DecoArt, but all thoughts and opinions are my own. 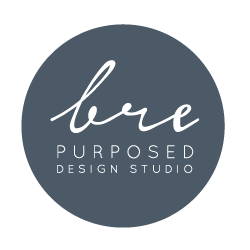 Thank you for supporting the brands that allow me to keep creating! Hello I’m knew to painting. Did you just sand before the initial coat or in between coats also? Love it! What is the color name? Thanks Marie! I’m just glad someone could enjoy it! And yes, CCP has beautiful knobs! 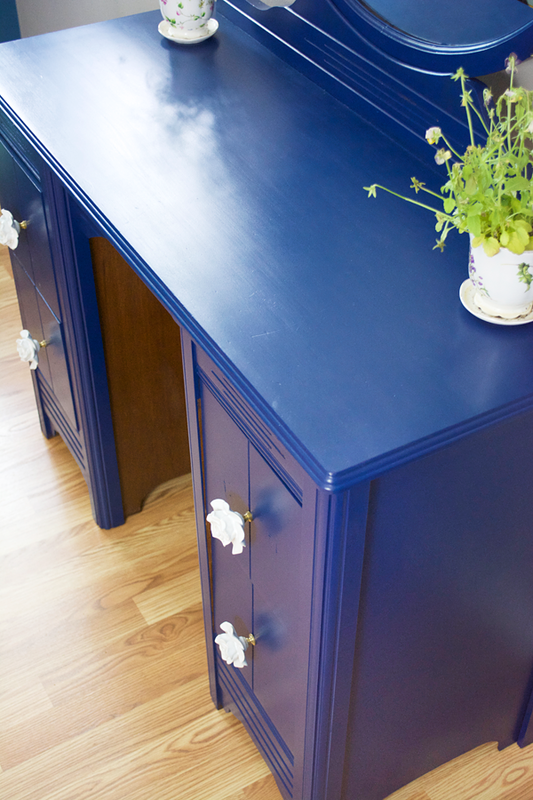 SUCH a gorgeous colour and those knobs are SO sweet! Hi thanks for sharing the paint, I’m in the middle of painting a piece and I’m getting a horrible flashing on the top. I’m using Behr premium plus ultra stain blocking paint and primer in semi gloss enamel. I’m applying it with a foam roller. Do you have any tips for achieving an even sheen? I also get the same flashing when using sherwin williams advanced enamel paint.